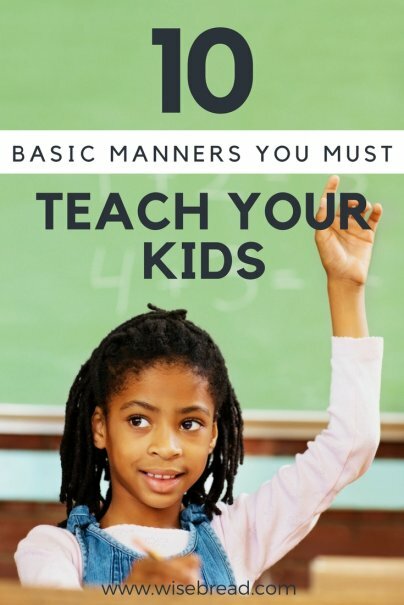 I'm sorry, but it's going to be a lot harder than you thought to teach manners to your children. You behaved at home, as a child, and then you went to college, where you likely misbehaved. Eventually, you found yourself in a relationship, and were probably very free about what you said and did. And then came the children, who are just tiny sponges. They soak up everything their parents say and regurgitate it, most often inappropriately. The best way to teach manners to your children is not to immediately hand them the 18th Edition of Emily Post's Etiquette (although I do think that's a lovely graduation gift). They need to learn the rules below before they can read. They need to learn them from you, their parents, and you need to model these manners. Consistently. You want your kids to be successful and get ahead in life, and they won't be able to get through job interviews without shaking hands properly. They need to know they cannot talk on their cells at the symphony. They will need to write thank-you notes. If you don't show them how, who will? Below are 10 types of etiquette rules you really need to teach your children. These are not behaviors, such as not being a bully; they are the rules of a civilized society. Here we have the holy grail of beginning etiquette for children. Master these four phrases, and practice them around, and with, your kids. I work with a guy who interrupts anyone and everyone, all the time. Every time he does it, I think, "Your mother failed." It is rude to not let someone finish their thought. Children are, by their nature, impatient — but they need to learn patience, which includes not interrupting. When the interruptions happen, say "Please don't interrupt. Let me finish what I was saying." Making introductions is difficult for adults, let alone children. As an adult, though, isn't it nice when someone introduces you? I have found that kids can master this, but they are going to need prompting to remember ("Ben, did you introduce your friends?"). Even the very young can handle "This is Jason, and this is Katie." If an adult comes to your house, your child should stop what they are doing, and come say hello. Ideally, the child should offer their hand to shake, and say "Hello, Mrs. ____." If their friends are present, further introductions should be made by the child. When the adult leaves, the child should come and say good-bye. Many children are very shy about introductions, so be patient and keep working on it. Following an introduction, or a greeting, an adult will usually attempt to talk to a child. Most of the time, the question will be "How are you?" "How are you today, Uriah?" "I'm GREAT! I have T-ball today! Uhh, how are you? Do you want to see me hit this ball? I had CAKE today! Last week I made it to third base!" Yes, I find him completely charming. Most children, though, I find, just ignore the adults. That's not okay, parents. Even if your child is shy, teach them to smile and say "I am fine, thank you. How are you?" It is my sincere hope that your family, no matter what its makeup, sits together at least for the dinner meal. A good chore for even young children is to learn to set the table. Once seated, you may say grace, or have a family custom — but please, no cell phones or other electronic devices at the table. Use this time to reconnect as a family, and instill some basics. Before each meal, wash your hands. Do not interrupt another family member's story. This is an important time for everyone to share their day. If the child wants second helpings, this is when we use "Please pass the ___." When the food is passed, they should say "Thank you." Burps happen. They should be silent, and followed by "Excuse me." No belching contests, please. If you have a cold or cough, sneeze or cough into your tissue, and then go dispose of the tissue and wash your hands again. If you have no tissue, sneeze into your sleeve, and then go wash. Absolutely no picking or scratching. When the child is done with dinner, they should say "Please, may I be excused?" and when permission is granted, they should take their plate, utensils, and napkin to the kitchen (and follow whatever cleanup rules you have). Do not nag ("I told you a thousand times...") at the table. Just keep correcting, or the dinner experience becomes associated with battles. You will be really glad you taught them table manners at home before you take them to restaurants, which can be intimidating to children who have no practice with napkins, silverware, and complicated place settings. Movies are a good place to start teaching your children about how to behave at a public performance. Hit the bathroom and get snacks ahead of time, and encourage them to be quiet, or whisper. Next, try a play or concert, and talk about intermissions, listening, watching quietly, and staying in your seat. Before the event, explain the usher's job. Not okay: Gum, candy wrappers, cell phones, or kicking the seat ahead of you. Being able to compose and send a thank-you note is another skill that will serve a person all their lives. You should write them with the child until approximately age eight or nine, when they should have the ability to write their own. You may need to help them get started. My "trick" in getting thank-yous done was to get out a nice array of stationery, cards, stickers, fun stamps, and colorful pens. I also had my address book at the ready, and mugs of cocoa and snacks. Then, we would do our notes together. Ah, the limp handshake. It still exists, which surprises me every time I encounter it. It's so easy to do it correctly! Here are the instructions. Stand up. Extend your hand. Using a firm grip (not a bone-crusher), grasp the other person's hand and grip/shake while you introduce yourself and the other person introduces him/herself. Here is a great video of some kids who have this handshake skill down! It's very simple: if you swear in front of your kids, they are going to swear, too. The problem is (and I'm Exhibit A): They will use these words at some very inappropriate times. Often, they may not know what the bad words mean, and explaining can help (they will probably be horrified). This is especially hard because adult modeling is so poor. You can be a part of that change, though. Readers will probably disagree, but I don't think electronics, or most specifically cell phones, belong at the table, movies, concerts, performances, weddings, funerals, churches, or school. I will hopefully assume you do not use your cell while driving (and that includes texting), which is simply dangerous. I was recently at a picnic, and one of my old friends did not bring her daughter, saying "She is too much of a brat." I remember thinking, well, that's your fault, and what a shame, because the other children were having so much fun. Yes, teaching manners to children will try your patience, but it will ease their passage into adulthood when they master the basics. Anything we've missed? What manners do you consider absolutely essential? Why is it only the mother who failed when a person displays bad manners? Dads have an equal responsibility in teaching their kids how to behave. Thank you! All responsibilities fall on the mom. Healthy eating habits, good grooming habits, good manners, nightly reading, etc. all somehow up to the mom (full time (outside the home) working mom or not, doesn't matter)). Step up dads. I had a difficult time reading this, as the author doesn't seem to have children. My protective instinct kicks in as a parent & I do not feel it is appropriate to force my child to interact with every adult. Yes, we practice good manners in our home, but the community does not always reinforce what has been learned. There are many entitled people out there who have no clue what it's like to interact with a 2yr old on a daily basis. My child is not a performing monkey, nor is she developmentally able to be a 3ft tall 30yr old, she's 2... While I do agree that these are important skills, the expectations need to be tweaked for safety, appropriateness, etc.